Love this shot so much! This photo was taken in a very well known botanical park on my Christmas holiday visit to my beloved hometown Palanga. Palanga is a small seaside resort town in western Lithuania, on the coast of the Baltic Sea and has a population of around 15 000 people. During the Summer season it is heaving with tourists attracted by the white sanded beaches, sand dunes, beautiful nature and fresh air. Winter season though, is completely opposite and is so tranquil and free from disturbance. I honestly think that this shot would not of been possible with all the tourists walking around in Summer. I really did not want any people in this photograph so I thought that morning would be the best and only time for it. I also assumed that the Christmas holiday period will give me an advantage because most of the people will be spending time with their families and friends. Drone photography is very weather dependent so I was really hoping for a nice, dry, with no wind day so I can actually get my little bird to the sky and take some shots I was thinking about for a long time. I remember it was a very cold but calm and cloudy day. I think I got lucky there and the lighting and flying conditions were just right. At this time of the year the Sun goes up relatively quick so having a few clouds in the sky was vital to get some diffused light which allowed me to get a well exposed with some soft shadows image. This image was taken with DJI Mavic Pro drone and Polarpro circular polarizing filter (CPL). Normally I tend to shoot in bracketing mode so I can merge images together and get a high dynamic range which gives so much more flexibility in a postproduction without loosing any quality. I also noticed that merging several shots together helps a lot to improve the quality if you are planning to print it. However, this time I managed to get away with a single shot because of the soft and even lighting caused by the cloudy sky. I grew up in this small town so I know the area really well and this location was one of my favourite spots. I used to go there quite often with my camera in my hands or just for a walk to clear my head. After I got the drone I was planning on visiting Palanga and was thinking of some potential locations where to photograph. Pretty much one of the first places I thought of was the botanical gardens and Birute's Hill on which this chapel sits. 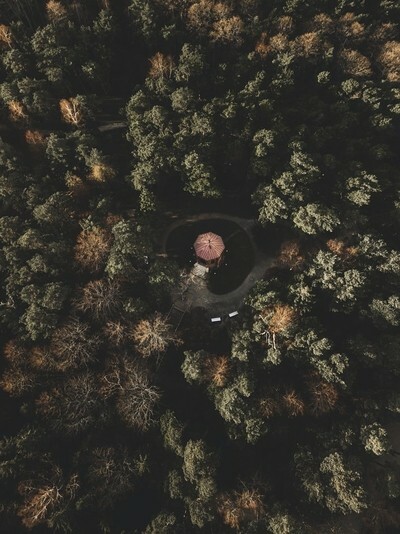 I thought to myself that this small chapel surrounded by all those tall trees would make a very interesting and intriguing shot! In my opinion, post-processing is a very important part of producing a powerful image and requires quite a lot of skill and understanding of colours and tones. Nowadays, when equipment is so advanced, automated and so easy accessible pretty much anyone can take a decent shot but not everyone can bring it to another level and make it stand out even more. This image was taken in raw (and I always shoot raw, it gives you so much more to work with). And then of course combination of adobe Lightroom and Photoshop to play around with some brightness, shadows, saturation, tones and contrast. I usually produce a few variation of each image with some different contrast levels or colour profiles. I also find that sometimes leaving the image and having a break for a couple of days clears your head and helps you to make this important decision for a selection process. In my equipment bag you will always find my DJI Mavic Pro drone and Nikon D610 camera. And then of course all the bibs and bobs which go with them. Spare Mavic batteries, spare propellers and my beloved ND filters. With my Nikon I usually bring along 2 lenses. 50mm f1.8 and 85mm f1.8. They are so light and bright, and absolute pleasure to shoot with. And of course some lens cleaning wipes and other cleaning kit to look after my gear in various conditions. I recently added some Neutral Density filters from Gobe to my kit list and it is a very good fun. Being able to use long exposure times during the day light really gives you a chance to be so much more creative and try some new ideas.